Click the button below to add the SM-GPS-2 32 to your wish list. 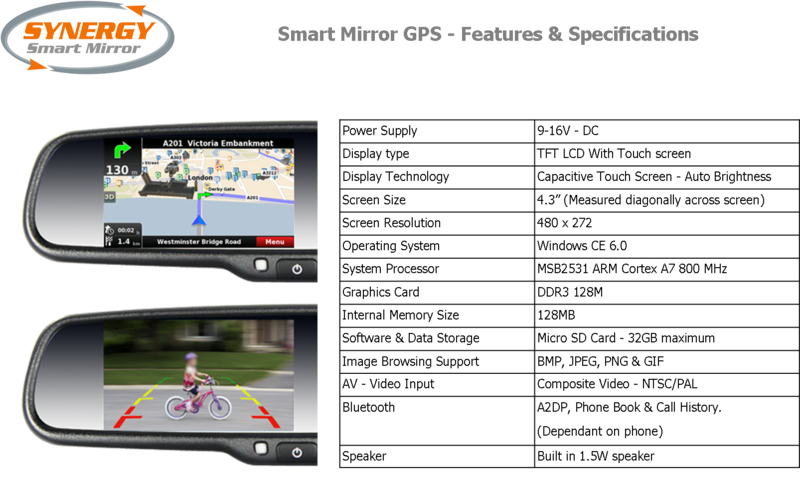 The Synergy GPS Smart Mirror provides Touchscreen Satellite Navigation and a 4.3” Rear View Camera Display, fully integrated into an original equipment style Rear View Mirror. Bluetooth is also an option which provides safe Handsfree operation, with an external microphone. All these features provide an elegant solution in one neat package. A range of camera’s & vehicle specific mounts are available to suit most cars and light commercial vehicles.